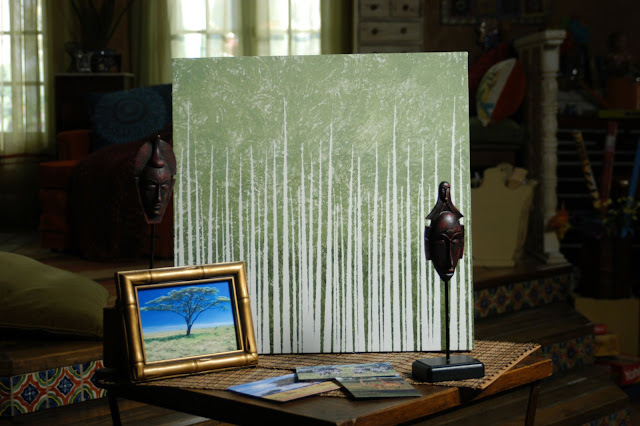 Create a modern grass painting with a unique painting process that combines strips of shelf liner with warm green paints. 1. Roll out the shelf liner and tape down. 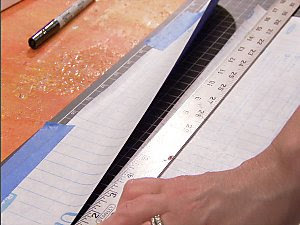 Using a yardstick, mark points on the contact paper that are 17", 14", 11" and 9" tall . Next, using a craft knife and a metal yardstick, cut the paper at marked points. Line up the yardstick at the center of one of the paper’s boxes and cut down to the base at a slight angle. Doing this on both sides will leave a long, thin triangle shape. You will need 6 strips that are 17" long, 20 strips that are 14" long, 15 strips that are 11" long and 10 strips that are 9" long. The strips should resemble large blades of grass. 2. Attach the strips to the canvas. Beginning with the longest strips, keep layering until the canvas is covered. Wrap the widest part of the strips around the bottom of the canvas; pointed ends should be facing the top of the canvas. 3. Pour a small amount of olive green paint on a plastic plate. Add an equal amount of gel medium to the paint and mix thoroughly. 4. Wet a rag and wring it out. 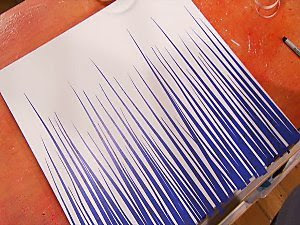 Forming it into a ball, dip it into paint, blot off the excess and begin painting at the base of the canvas. Paint the darker color 1/3 of the way up from the base of the canvas. Add a drop or two of white paint to the olive paint and blend to create a lighter shade of green. Continue painting the canvas with the lighter shade, blending the two colors together about 2/3 of the way up the canvas. Add more white paint to create a very light green shade and continue painting to the top the canvas, blending as you paint. Let the canvas dry. 5. Carefully remove the shelf liner paper and add a picture hanger to the back. I love how this turned out! To me it looks like a beautiful aspen forest. I was looking for something new and inventive to give my mom for her birthday. I used 20 x 24 canvas and adjusted my "grass blades" to fit, then used Cadmium Yellow, Cadmium Orange and Thalo Yellow Green on three different canvases. Each one is uniquely different from the other. She loved these and it made a nice modern display over her sofa. Undecided on putting black frames around these, though. She loves them "natural", so they'll probably stay that way. Wow! this craft idea is cool. 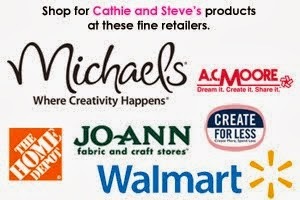 It gave me an amazing gift idea for my family members who treasure handmade gifts. 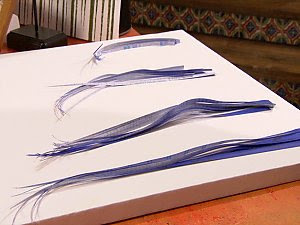 however, I would love to use a variety of colors for this craft.